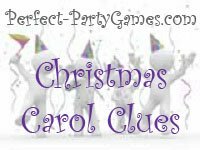 Summary: Christmas Carol Clues is a game that describes the title of a Christmas song which you have to decode. and are happy to provide them to you absolutely free. that you "Like" our Facebook page. Click the Like bottom below, then go to our Facebook page. ALL our FREE printable games. The answer key is the second page of the print out so you will want to tell your printer to only print the first page for the number of guests you plan on attending. You will also need a pen/pencil for each player. Give the players 5 minutes to figure out the song titles to the clues given. Winner: The player who has the most correct answers wins.